Thanks, I'll change those descriptions to match on my end. The help is definitely appreciated. The default ship designs acquired when you gain the appropriate hull tech place more weapons in a hardpoint than the hardpoints should hold. In this save, take a look at the Battleship design, the Medium hardpoints specifically. There are 8 turbolasers in one hardpoint, but choosing turbolasers for another Medium hardpoint only allows 4. The same was seen (no save, sorry) for Carriers as well, and now that I think back, I think it occurred in earlier hulls also. EDIT: I'm pretty sure Supermint, below, has it exactly right. And... holy mackerel, all this time I didn't understand weapon selection at all. I had no idea one had to click the upgrades to use them - I assumed since they were all listed (but in gray, dummy!) they were all automatically included. Dang it. Last edited by grothmag on Sun Apr 08, 2018 10:58 pm, edited 1 time in total. The default Turbolasers may have Rapidfire already and when a default design is setup it takes into account what upgrades are available for the weapons and applies them where it can. So that will probably be the cause. Thanks for this upload. The bug should be fixed as of r22110. nweismuller wrote: Even after the batch of text corrections last patch, the descriptions for clicking on Opil, Gems, and Precious Metals are still incorrect for current observed values of those resources. The descriptions for clicking on the resources indicate a bonus of +5 coins per market for Opil and Gems, and +2 coins per mine for Precious Metals; the planetary economy reports and overall imperial incomes indicate an actual bonus of +10 coins per market for Opil and Gems and +5 coins per mine for Precious Metals. This is such a simple fix I'd do it myself on my own game if I had been able to find the files with resource descriptions. This should now be patched in the vanilla version of the code as well (as of r22112). If marauders capture an outpost, an error occurs when their monster economy attempts to update the population of the planet if it is unpopulated (which is usually the case with outposts). 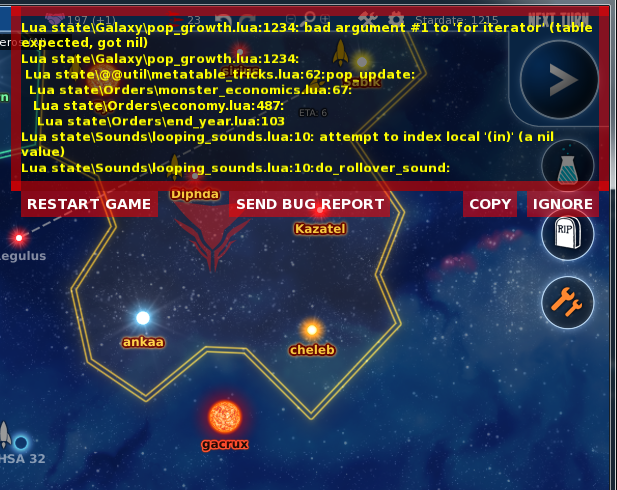 I did some tracing and the planet that is causing the error is Gacrux I, a rockball with an outpost orbiting it. -- I deleted the autosave_1 folder and it started up fine. I think the issue was due to my laptop shutting down randomly causing the file to be corrupted. All good now. Last edited by Captainspire on Wed Apr 11, 2018 8:31 pm, edited 1 time in total. It looks like the game may have crashed earlier while attempting to do an autosave, leading to a corrupt save game. Please try deleting SaveGames\autosave_1, and let me know if that fixes it. harpy eagle wrote: If marauders capture an outpost, an error occurs when their monster economy attempts to update the population of the planet if it is unpopulated (which is usually the case with outposts). Thanks for the report. This one should be fixed as of r22127. Should be fixed as of r22131. Thanks for the report. I *think* both of these ought to be fixed as of r22135 (though you need to replay the whole of stardate 1524 to avoid any errors). Please keep sending in bug reports as they pop up. Sometimes when a planet is set to city planning, when going to the next turn it will be taken off city planning and a report issued stating that "We were unable to continue city planning at..." despite there being ample food. See the attached savefile. The colony at Beid is taken off city planning despite having enough empire food and transport. Not sure if this is a bug, but are ashdar destroyers supposed to have better armour than their light cruisers?